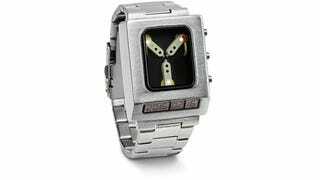 Reading the time on the Back to the Future Flux Capacitor Wristwatch is pretty fun. Press the bottom button and then get ready to count lights. Time is divided into hours, minutes first digit, minutes second digit - so it looks confusing, but is very easy to read. (Example: 10 lights, 5 lights, 3 lights = 10:53 - and it repeats). At the same time, the time circuit LCD display will show you the date.